I realized this week that Mother's day is rapidly approaching. Yikes! My parents have been ummm.... Helping.... my grandma sort through piles and piles of paper and they said that she had kept a lot of the cards we have sent her over the years. It's time to restock Grandma's stash! Recieved this lovely stamp in the mail this week. In record time, I might add. Brought out the markers and the newest episode of Glee and had myself a fine old time. Posting this on the run- work calls. Have a super holiday full of inspiration for all those moms out there! This card is just fabulous. The colors are perfect! Oh!! She is going to be so lucky to get this one! Beautiful! Fabulous card. Love the colouring. this card is to cute. Very cute! I love that stamp and still yet to purchase it. Glad you got yours just in time. Beautiful.... can't you just imagine all the blossoms raining down? Hi Sarah! I have missed you on FWF, so glad you are here this week. Your card looks Beautiful!! Love the colouring you did and the colour blocks on the background. I have been wanting to reply to your question on the background of one of my cards - I usually use the Copic colourless blender with a light colour like BG10 or G000 or BG000. I will add the colour then blend it with the colourless blender till I get the effect I like. Hope this helps. Have a great weekend!! Sarah, this is so so pretty! This would be perfect for your granny. 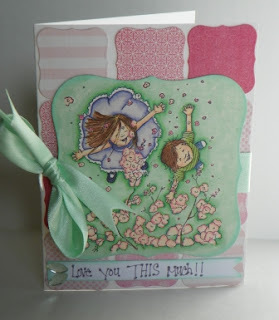 Love the coloring and the stamp/sentiment goes so well with each other. Welcome back! I haven't seen you at FWF in awhile. This card is wonderful. I love the smaller decorative squares behind the main square. And, of course, the colored image. Love IT! So lovely! Just looks like springtime! Love all the colours in this one! Great card! Very pretty card! 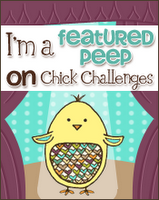 Love the image and your coloring is beautiful! TFS God bless!! This is such a pretty card! Love it! I'm ridiculously late in commenting on this card, but I thought I'd swing by and say thank you for your sweet comment(and LOL about the die-shopping--that's something I would do, too). Your card is beautiful--great coloring, and I love the sentiment with it. That's great (I think) that your grandma kept your cards for years. How sweet!